So it took took me two months to do but I've only gone and finished the entire seven seasons of 'Gilmore Girls'. 154 episodes in 60 days, that's not too bad right? Now I'm at a loss with what to do with my afternoons. For those who haven't seen the wonderful show of the noughties, stop whatever you're doing and head over to Netflix. Trailing the lives of mother-and-daughter duo, Lorelai and Rory, as they tackle school, careers, and many many romances, this show is the definition of charming. And incredibly insightful at times. I first stumbled upon 'Gilmore Girls' when I was 15. By then I'd see every episode of 'Friends' hundreds of times and was on the hunt for something new. At that age, E4 was the only channel I watched religiously and an episode of this quirky show aired everyday at 5pm. And before I knew it, an hour of 'Gilmore Girls' was incorporated into my everyday routine. Without sounding like a major nerd, the amount of name-dropping of great literary works that went on in this show always inspired me to read. Now that I've finished all seven seasons it's funny looking back on season one and looking ahead to what the Gilmores achieved. Graduating from Yale and building a business is impressive stuff - meanwhile I couldn't tear myself away from Netflix. Thank god they're fictional. 2. Things won't always come easy. One of the things I loved about this show is that, although Rory was presented as a prodigy child, she didn't always get exactly what she wanted. She wasn't chosen for the New York Times internship, she had a wobble in her third year of college (a feeling I know all too well), and she had to choose her personal ambitions over a series of boyfriends. Relatability is rare in a TV show but 'Gilmore Girls' nailed it. 3. Bad decision-making is inevitable. As much as I love this show, sometimes the Gilmores were downright infuriating. Getting back together with your married ex-boyfriend? Failing to tell your parents you're engaged and then deciding to go on a road-trip the day of your wedding? At times, it was painful to watch. But it's all about how you deal with difficult situations and how that makes you a better person for it. 4. Family will always be there. Like any classic TV show, you look back through all the seasons and can't count how many characters have been and gone. Lorelai and Rory are eachother's constant. And that's something I really see in my own life. Often the people you think will be around forever can be the ones to disappoint you the most. Of course it's sad but when it comes down to it, I'd prefer to have a wonderful family over flakey friends. 5. Never be ashamed of your coffee habit. My personal favourite life lesson. It's terrible but I literally cannot function without caffeine. I even used to work in Starbucks - such was the intensity of my addiction! I can't begin to think about how much money I've spent funding my coffee habit over the years, I wouldn't know where to start. But the Gilmores embrace their coffee-loving lifestyle so I'm no longer ashamed. I'm a coffee addict and proud. 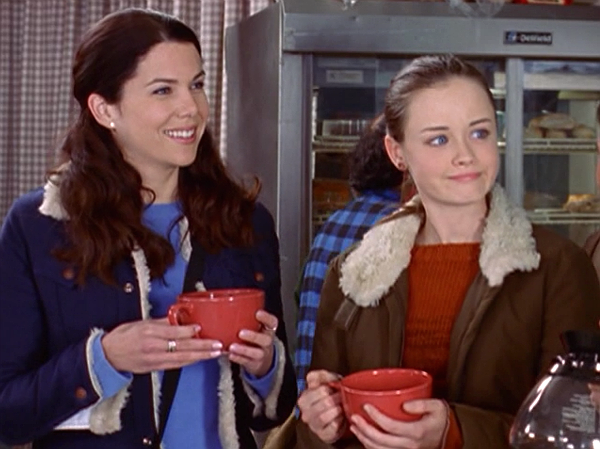 It's easy to understand why 'Gilmore Girls' is so beloved. The internet practically exploded when Netflix announced its debut. It's witty, funny, and emotional watching and I'm almost sad that I've finished the series... again. Who knows, give it another five years and I'll be ready for a third viewing. Review: 'Glam Glow' SuperMud Clearing Treatment. Ted Baker's Done it Again. Searching for a Signature Scent. A NARS Lip Pencil Love Affair.